Verlandieu Marcellus fellowships with the believers who meet at the Pennsauken Gospel Hall. We asked him to write the report below so others might pray for this work but also be encouraged to do something similar in their area when the opportunity presents itself. No tents or buildings are required. Set-up is minimal. A love to reach lost sheep is the prime motivator and essential ingredient in this work. In reading the story below don’t miss another story – as to how Verlandieu came to Christ. How much more encouraging does it get! The gospel work among the Haitian people in Hammonton, New Jersey, started in the summer of 2002. Sisters Trudy and Judy Odom of the Barrington Assembly (NJ), and others, were visiting Mexican migrant-workers the previous year with the gospel in Spanish. At that time they took notice of the Haitian people nearby at the Mohawk-farm. However, no one in the group spoke Haitian Creole, which meant, unfortunately, nothing could be done as far as Gospel outreach was concerned. Trudy Odom taught English at Woodrow Wilson High school where I was a student. Miss Odom was my teacher during 2001 and she invited me to an after-school Bible study that she and Don Draper held at the school. Two to three months later, I came to faith in Christ. The following year while the Christians were visiting the Mexican laborers again, I was asked along to translate for Brother Andre from the Barrington assembly who was to preach to the Haitian people. My Creole was poor and my translation, at best, were paraphrases of Andre’s messages. Since that time, I have been associated with the work with the Haitian migrant workers. At different times, others have been a tremendous help through much-needed encouragement, prayer, help with the cost of driving-expenses, typing and printing up Creole hymn sheets, providing Bible-texts, tracks, Bibles, reaching out to the English-speaking children and even with the preaching. Nine years later, four new farms have been discovered while the work that started at the Mohawk-farm still continues. Visits begin around the first of June and run to the end of July or the first weekof August. My work schedule restricts the number of evening visits I can make; but I am often free to make three visits per week. 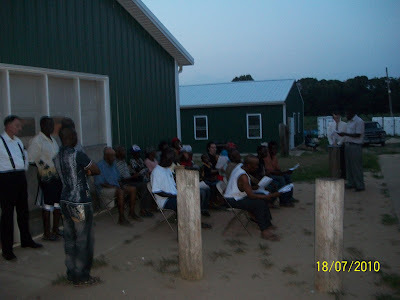 In the past, we took the Gospel to two or more farms per evening. But we have found that such a schedule leaves us with very little time to visit with the people after we preach. As well, for those who come along to help, who are either older or have a demanding career, the late-evening return after visiting two farms makes it impractical. We have, therefore, tried to keep the visits to one farm per day if it could be helped. It is a thirty to forty minute drive from the Pennsauken Gospel hall to Hammonton. We often arrive around 6-7:00 pm, not long after the people finish work. Those willing to attend would hurry for a bite then return to stand for the singing and preaching. For the past couple of years, we usually take fourteen folding chairs from the Gospel Hall for the comfort of those who would prefer to sit. Receptivity varies year to year, farm to farm, week to week and visit to visit, but on the best day this year we had over forty in attendance and on the lowest - six. Women, with the exception of one farm, usually make up over 75% of the meetings. Our meetings are usually outdoors as we do not like to impose on those who are resting - especially those who aren't interested. At one farm, the women prefer that we speak indoors and if there is ever a threat of rain we are always asked inside. Visible fruit is obscured by the fact that the same people do not always return. Every year, therefore, there is always the added excitement of finding out how we will be received. But the Lord has been good in that there have always been those who wanted to listen. For our part, we count it a privilege to tell precious souls of God’s free forgiveness of sin through faith in Christ while not pushing formulaic prayers, nor encouraging empty professions to affect results. If there has been any fruit, we are content that it is known to Him.